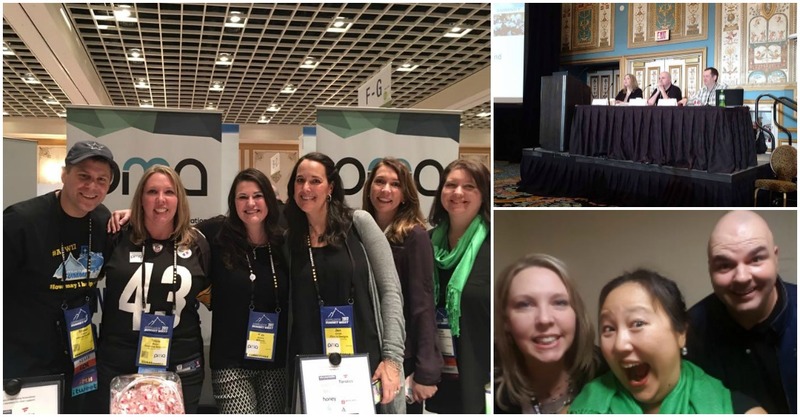 Now that I’ve been home for a day, I am pulling together and processing all that happened at Affiliate Summit West. I’ll be honest that I wasn’t really looking forward to going–mainly for personal reasons. I was having a hard time getting motivated to go but knew that once I got there, I would be happy I was there. The PMA Brunch was terrific! We had a wonderful turnout of old members, new members, and even prospective members. Agencies, merchants, affiliates, networks, and others all mingled together to kick off the conference in familiar, energetic way. I have to thank Rachel Guillot for all of the work she did pulling it together for us! The Meet Market was kind of a blur to me. I’m not even sure how I managed to pass so much time in there without visiting most of the booths. We had a nice spot at the back and it was encouraging to have PMA members seek out their stickers because they wanted to show off their membership. Over 20 members volunteered at some point throughout the day to help us spread the word about the organization. I’m incredibly lucky to have Tony Pantano and Adam Viener to watch Steelers games with. ASW always seems to fall on the weekend of a Steelers playoff game, and I am glad I can hang out with them and twirl my Terrible Towel (and sometimes score free drinks). I tend to take a lot of advice in general from Eric Nagel, so I knew that I would appreciate his session on “Maximizing Productivity: Tips & Tricks to Getting More Done.” I especially needed it now with the start of a new year, new initiatives, and a full inbox. I have to get back to making lists and prioritizing. I know he’ll help hold me accountable. The ShareASale party was one of my favorites in a long time. The club was beautiful, the music and dance floor were hopping, and the Tailgate theme was casual but fun. I enjoyed dancing and goofing around with some of my favorite affiliate managers and OPMs (like Snow Consulting, AffiliateManager.com, Wade & Joe, etc) as well as the FMTC crew. All Inclusive Marketing hosted a terrific suite party for bloggers and I was able to connect with Char, Beth, Sarah, and the others on the team. I’m excited to try the bottle of wine I brought home from Wine Awesomeness! Sadly, it was time to say good-bye to Carolyn Kmet, but I will still bug her about the PMA. I spent a lot of time missing my mom, Cindy Ballard. It didn’t seem right not having her there! What can I say about Affiliate Karaoke? Nathan Smith works so hard to organize a place where we can go and be ourselves and cut loose. I don’t sing as much as I used to, but it’s in part because I genuinely love just sitting and watching everyone else! I missed the Tuesday Keynote and Pinnacle Awards because it was the only time I could make the Rev Share Roundup, and it sounds like I missed quite a bit!! I plan on catching Sean Dolan’s keynote as soon as they release the video not only because he is a Steelers fan but also because I heard it was amazing. A lot of friends of mine earned Pinnacle Awards, which is fabulous, but I was most excited to hear that Rachel Honoway was honored with the Legend Award. She is deserving for so many reasons!! Speaking of Rev Share Roundup, I was once again surprised to see so few affiliates in there. Maybe because it overlapped with the keynote? I already work with most of the merchants that were there, but I did meet one new one that I have big plans for already! Lastly, I cannot convey the value of the time that I spent with my dear friends and business partners Eric Nagel and Todd Farmer. Although we didn’t talk a lot of Wine Club Group business this time, we always make sure to touch base and set plans and priorities for the next year. Aside from the business, I feel as though I am the luckiest girl in the world to have them around me. Never underestimate the importance of making connections at Affiliate Summit and following through with them!! As I said at the start, I was not so excited about going; as you can tell, however, it all turned out great. I’m sure I’m missing lots of things and lots of people, but the post would be 5 pages long if I tried to document it all! Suffice to say I am looking forward to Affiliate Summit East in August. 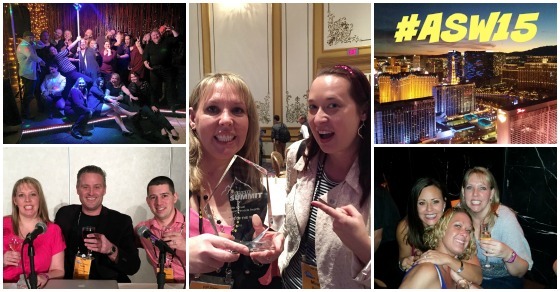 How was Affiliate Summit for you? What stood out as special personally or for your business?